In the early 80's an aircraft engine washed up on the beach at Umina , It was reported in the local paper at the time and the motor was dumped at Woy Woy Tip. It was Tuesday the 5th of August 1955 and Anthony Thrower had just landed his Auster J/4 Archer at Bankstown airport when his motor stalled at the end of the runway , he decided to hop out and manually start the engine by hand turning the blade ( a push start for a plane ) . the engine kicked into life and the plane moved off with a bump - trouble was Tony was not in the cockpit but running alongside trying to grab a wing strut ! In what was now becoming something from a Monty Python movie a second aircraft was deployed - a Meteor jet fighter was sent to shoot it down but it's guns jammed. 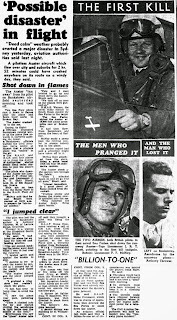 At 10.15 a.m 2 Sea Furies on loan from the Royal Navy were sent out to bring down the rogue aircraft , guided by the radar installation at South Head they intercepted the plane at 10.000 feet about 7 miles east of Broken Bay and it was shot down into the sea. The Civil Aviation Authority later described the incident as a billion to one happening ! That is bloody hilarious. Very Pythonesque. I remember this happening when I was a very small boy. 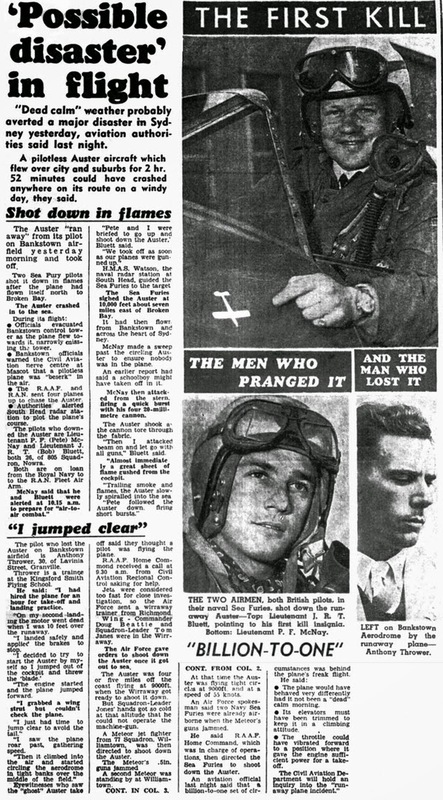 There was a general panic that the aircraft would crash somewhere in Sydney. I've told people about my recollection of this pilotless plane and it was always quite obvious that they didn't believe me.